The appellations of Pessac-Léognan and Graves are also located on the left bank of the Garonne River, south of the city of Bordeaux (the Médoc is in the north). And while the weather and gravel soils here are similar to those of the Médoc, Pessac-Léognan and Graves produce very different wines. 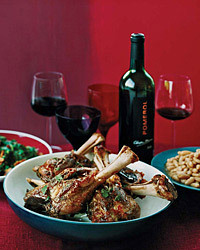 Their red blends often have a smoky, earthy scent and subtle flavors that recall berries, currants and red cherries. Graves wines tend to be lighter than those of the Médoc and less dominated by Cabernet Sauvignon. In neighboring Pessac-Léognan, the blend is similar, but its wines tend to be more formidable and dark. Both regions are good sources for values, though more are found in Graves. Because of their generally lighter structure, the wines of Graves tend to be more adaptable with food and can even pair well with meaty (but not too oily) fish, like Marcia Kiesel’s simple pan-seared halibut steaks with lemony parsley sauce. At the same time, wines from both Graves and Pessac-Léognan often have a smoky intensity that also makes them natural partners for dishes like Marcia’s rosemary-potato-bacon skewers. A blend of Cabernet Sauvignon, Merlot and Cabernet Franc, this plummy Graves has a distinct cedar note. Owner Eric Perrin overhauled this estate in the 1980s and now produces a minerally, sharply focused red. Among the wine properties owned by André Lurton, Cruzeau is known for its smooth-textured, smoky red. This cherry-inflected red is one of many good wines superstar consultant Denis Dubourdieu helps make. Classic Graves characteristics—a scent of roasted earth and light berry flavors—define this vibrant red.